This is my inspiration for this Frozen-inspired snowman ornament. 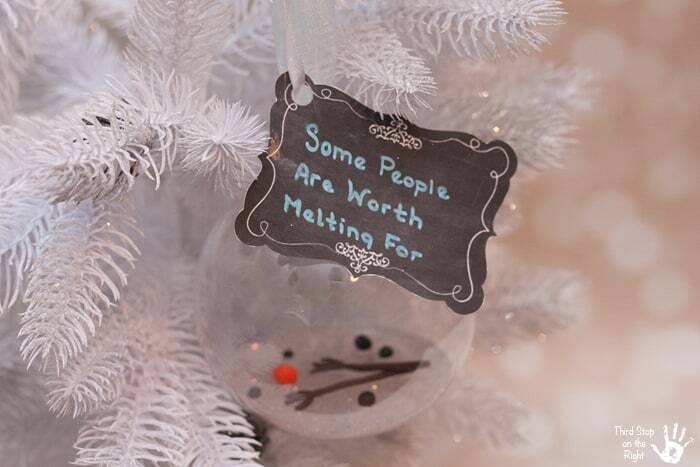 You don’t have to be a Frozen fan to appreciate this ornament, though. It speaks to anyone who would give anything, including their life, for the people they love. 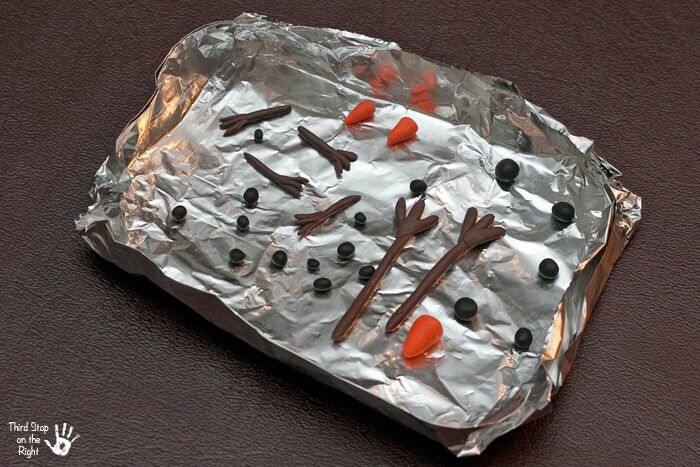 First, you will want to sculpt the snowman parts. You will need two arms, two eyes, three buttons, and the carrot nose. Since this snowman will have melted you aren’t going to need a body. I bought several kinds of glitter. It was actually a white and silver sampler pack and I mixed several of the varieties together. The next step is to mix your clear casting resin. The amount of resin you will need will depend on the size of your ornament bulb. You will only want to fill the bulb about 1/8 of the way. 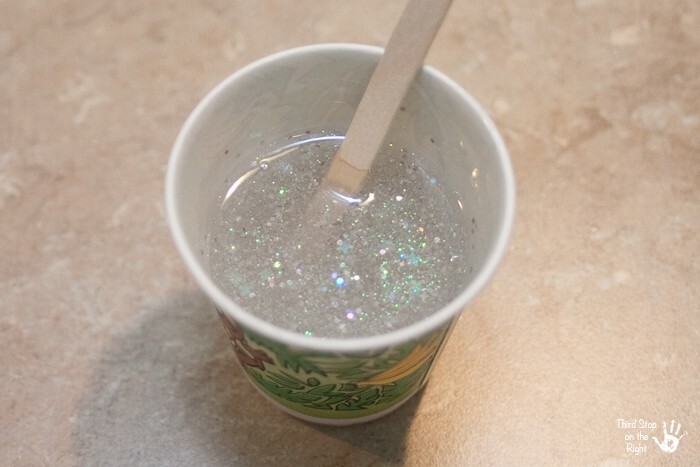 I used a small paper drink cup to mix the resin, hardening agent, and glitter into. Make sure the glitter is fully mixed in. 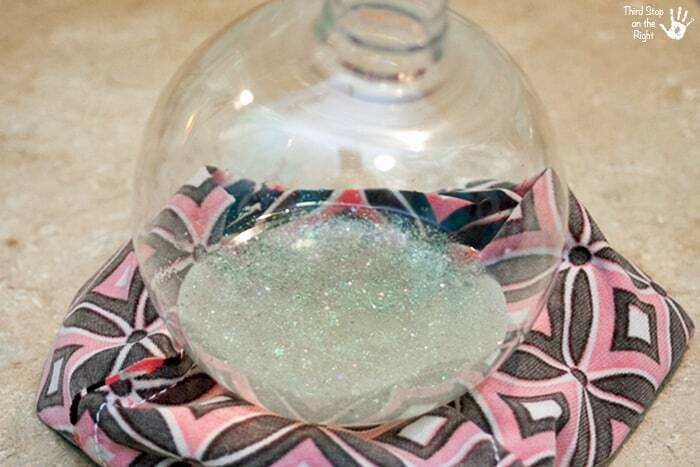 After you have mixed the resin, hardening agent, and glitter you will want to remove the top of the ornament and pour it into the ornament bulb. I found the paper cup is really useful for this since you can squeeze the sides into sort of a funnel. Very slowly, and very carefully, pour the mixture into the clear bulb. You will want to make sure that you do this carefully so that it goes directly into the center of the bulb and doesn’t touch the sides. 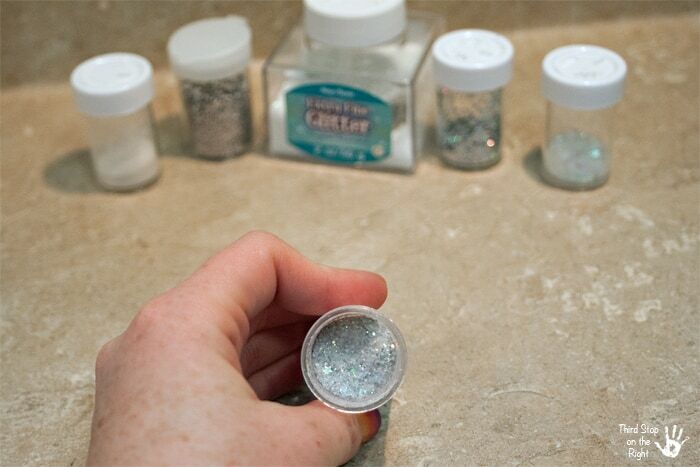 If it gets on the sides then the glitter will also stick to the edges. After pouring in the mixture, let the mixture harden somewhat. Otherwise, when you put the snowman pieces in they will sink to the bottom. 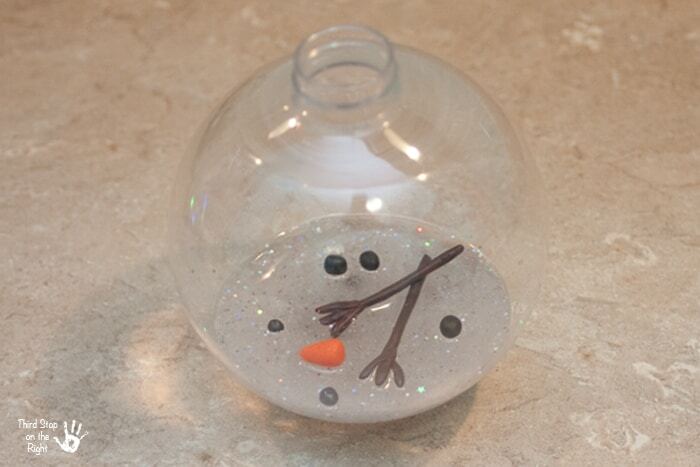 Let the resin become gel-like and then you will want to drop in the pieces of the snowman. I used a piece of wire to lower in the snowman pieces. You will want to keep the top off of the ornament while the resin hardens. You should allow 24-48 hours for this to be complete. The reason for keeping the top off is that the hardener, when mixed with the casting resin, will create a heat reaction. If you leave the top on the ornament it will cause condensation and might leave marks on the sides of the ornament. After the mixture inside the ornament has completely hardened, go ahead and replace the top of the ornament. 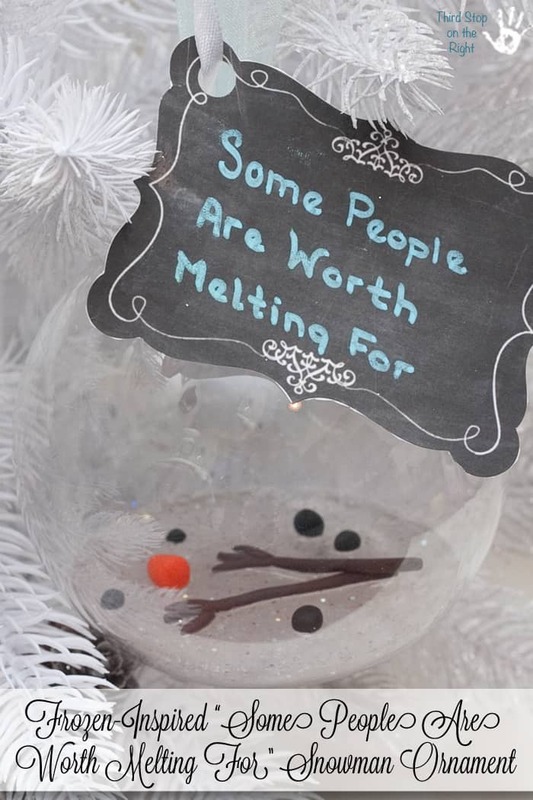 I used a chalkboard sticker and stuck it to a piece of scrapbook paper and cut around it to make a cute tag on which I wrote the phrase “Some People Are Worth Melting For” in a blue chalk pen. I then attached a ribbon to the tag and tied the ribbon at the top. I then looped the ribbon over a Christmas tree branch. I will note that these ornaments are a little bit on the heavy side when they are finished so you will want to make sure the ornament is well-secured on the tree branch so that it does not fall off. Now you have a cute, Frozen-inspired snowman ornament for either your tree or to give as a gift!